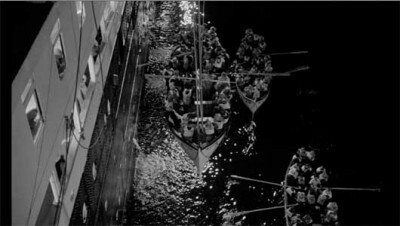 The other Titanic movie, 1958's stately, passionate A Night to Remember, seems destined to be the Olympic of disaster films. Just as the RMS Olympic wound up being overshadowed by her sister ship (you know, the one that crashed into an iceberg), A Night To Remember's fate lies in being the kinder, gentler, British-er take on the same events revisited in James Cameron's 1997 smasheroonie Titanic. Criterion's double-disc edition of the film, released as the 100th anniversary of the tragedy approaches, puts the film back in its rightful place as the most definitive chronicle of the disaster. No Jack, no Rose, no Céline Dion - just great storytelling. A Night To Remember was no small achievement in itself. When originally filmed in the late '50s, it was the most costly and ambitious production from Britain's The Rank Organisation. The filmmakers' first priority was faithfully visualizing Walter Lord's best-selling nonfiction book of the same name. Lord's book was the most comprehensive account of a tragedy that still held sway in the public awareness, one that was then in danger of becoming distant history as the survivors were dying off. Like Cameron's opus, the film pours an impressive amount of time and resources into historic accuracy, making sure that every set replicates the ship's quarters down to the last dish. The attention to detail also extends to casting actors who physically resemble the people they're playing. As for the story, screenwriter Eric Ambler pretty much sticks to the events as they happened. 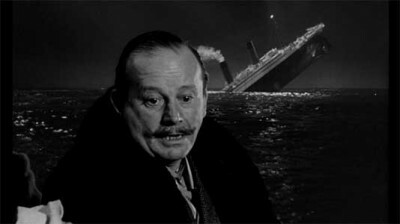 Although the heroic White Star line officer Herbert Lightoller (played by Kenneth More) is presented as the nominal main character here, it's really the ship itself - and the way the crew and passengers react to this slowly unfolding catastrophe - that takes center stage. The film begins with the ship's own beginning, as we witness the Titanic's christening (which apparently never happened) as dramatized with recreations and documentary footage from other ship launchings of the time. Following that scene are a few brief vignettes with passengers and crew in the days before the ship's maiden (and final) voyage in April 1912. These early bits not only demonstrate the unprecedented, even arrogant hugeness of the ship itself, they also serve as a brief window into the variety of people who ended up on the ship. With an economy of means, director Roy Ward Baker illustrates that the Titanic attracted noblemen and immigrants alike - that's all the information we need before getting whisked into history's most famous sea cruise. 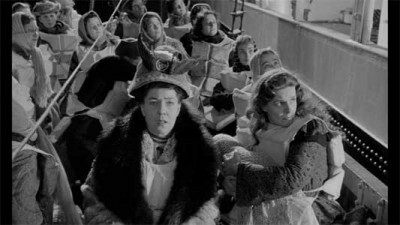 As we get on board the ship and drink in the luxurious surroundings and the haughty passengers that inhabit them, it becomes apparent that the film's director Roy Ward Baker intended to make the film a straightforward narrative that closely adheres to the reportage in Lord's book. There is a bit of symbolism, with the last shot before the iceberg hit being an innocent child's rocking horse, but for the most part the film is content to present the incredible events of that night as accurately as possible. Starting with the rash decision to steer the ship around the iceberg, resulting in a huge gash in the hull, the sinking ends up being like a lot of mass disasters that are essentially a pileup of unfortunate coincidences. 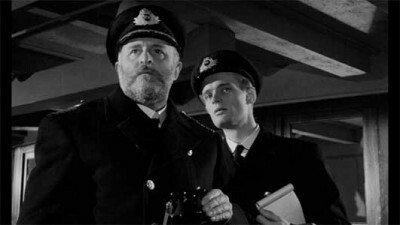 The character of Captain Edward J. Smith (Laurence Naismith) senses the doom of the ship early on as he realizes they're aren't enough lifeboats for all the passengers and the nearest ship, the Californian, is ignoring their signal flares and calls for help on the wireless. 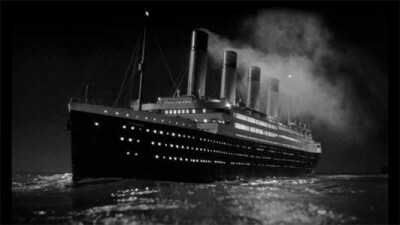 While the crew maintains order and shuffles the often unwilling First Class women and children into the lifeboats, we get a sense of gradually escalating dread as the characters start to realize that this "unsinkable" ship may in fact go down. The sinking itself is fantastically presented with a combination of a full-scale ship set and expertly done models. While James Cameron had state-of-the-art CGI and more proven research (most notably, the ship breaking in two before submerging) at his disposal, Roy Ward Baker's version remains the definitive one. What most struck me was the impressive way he weaves so many different real-life vignettes, from the humorous to the heartbreaking, from the hours before the sinking. These include a lot of bits that the Cameron version either referred to in passing (the lifeboat with only twelve occupants) or ignored altogether (the passenger who went back to her room to retrieve her lucky pig-shaped music box). The film is entertaining, well-crafted, touching, and something of a marvel in terms of its ensemble performing. The cast is full of reliably solid, non-showy Brit actors - some of whom (like David McCallum and Honor Blackman) might be recognizable from other roles. From the capable Kenneth More on down, the cast is committed to reenacting the essence of their characters and not calling attention to themselves (the only exception - the kid who stared at the camera). To be fair, the Cameron film conveys the enormity of the wreck more effectively, but framing the story in a contemporary plot and including those pesky fictional characters gives the impression that someone didn't think the actual events of the sinking made for compelling enough cinema. Maybe they came to admit to themselves that it was already done - beautifully - in A Night to Remember. 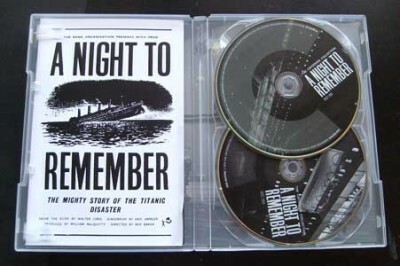 This 2012 edition of A Night To Remember is a reissue of one of Criterion's earliest DVDs (it retains the original spine number, #7) in a new transfer with a host of added extras. The two discs are housed in a clear Amaray keep-case with a 24-page booklet that includes an excellent essay by film critic Michael Sragow and reproductions of various Titanic memorabilia. Criterion has given the film a sparkling new digital transfer with a clear, basically artifact-free image enhanced for widescreen televisions. While I didn't have a copy of the earlier DVD to compare, the 1.66:1 high definition black and white image has a depth and luminosity that makes the discs of other films of similar vintage look rather underwhelming. The original mono soundtrack was also remastered for this edition in a clear, satisfying mix. No subtitles are available. Bonus materials on the first disc includes the original theatrical trailer and an audio commentary retained from the 1998 DVD and 1994 LaserDisc editions. Spoken by Don Lynch and Ken Marschall, author and illustrator of the book Titanic: An Illustrated History, the track is lively and interesting. The two men focus on the film's historic accuracy (and occasional missteps) in a manner that is generally in awe of the attention to detail on display throughout. The Making of 'A Night To Remember' (1993) visits with producer William MacQuitty and author Walter Lord as they reminisce over the challenges of adapting the material from page to celluloid. Although the piece is marred by an unfortunate soundtrack, it's filled with lots of great anecdotes and behind-the-scenes photos. The men seem rightfully proud of what they accomplished. Eva Hart: Survivor (1990) is a straightforward 23-minute interview with the plain-spoken Hart, who escaped the sinking on a lifeboat as a young girl. A few fascinating tidbits emerge from the talk, such as the terrifying way the child survivors were transported from the lifeboats to the rescue ship Carpathia. En Natt Att Minnas (1962), a half-hour documentary made for Swedish TV, is another one of those "where did they find this?" things which periodically show up on Criterion discs. Ephemeral but utterly compelling, the main focus of the program is on 75 year-old Agnes Sandström, who with her two daughters numbered as the only known Swedish survivors of the tragedy at the time. The interviews are supplemented with a poem and a folk song commemorating the 50th anniversary of the disaster. The Iceberg that Sank the 'Titanic' (2006), a 48-minute episode of the BBC's Natural World program, diverges from other recent Titanic efforts by concentrating on the iceberg and not the ship. Compelling stuff, sporting some luscious photography in anamorphic widescreen. With its nuanced direction and no-frills performances, A Night To Remember would make for enthralling drama even if it wasn't based on real events. It is real, however, and the filmmaker's laudable dedication to historic accuracy makes it even more emotionally resonant. James who? Criterion's wonderful double-disc presentation of the film makes it an easy inclusion in the DVD Talk Collectors Series.